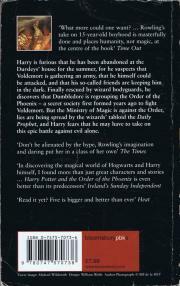 Harry is furious that he has been abandoned at the Dursleys' house for the summer, for he suspects that Voldemort is gathering an army, that he himself could be attacked, and that his so-called friends are keeping him in the dark. Finally rescued by wizard bodyguards, he discovers that Dumbledore is regrouping the Order of the Phoenix - a secret society first formed years ago to fight Voldemort. But the Ministry of Magic is against the Order, lies are being spread by the wizards' tabloid the Daily Prophet, and Harry fears that he may have to take on this epic battle against evil alone. 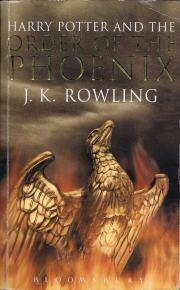 'Don't be alienated by the hype, Rowling's imagination and daring put her in a class of her own' - The Times.